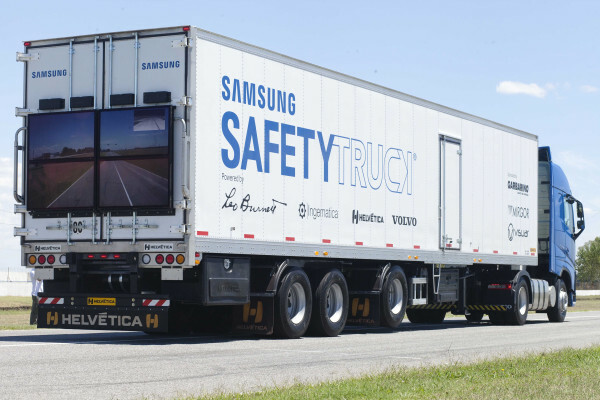 Samsung has made something that can only be considered as awesome from Argentina; the Samsung Safety Truck, a technology for trucks that seeks to reduce road accidents during overtaking. It should come as no surprise that Volvo is involved, being as they’ve promised that all of their vehicles will be deathproof by 2020. So we can see this passion as reflected in Manager of Marketing and Communications at Volvo Trucks, Valere Lourme, quote: “Safety is a basic principle in any project of Volvo Trucks and it’s what keeps the group active in their effort to develop innovative technologies that completely eliminate the risk of accidents. 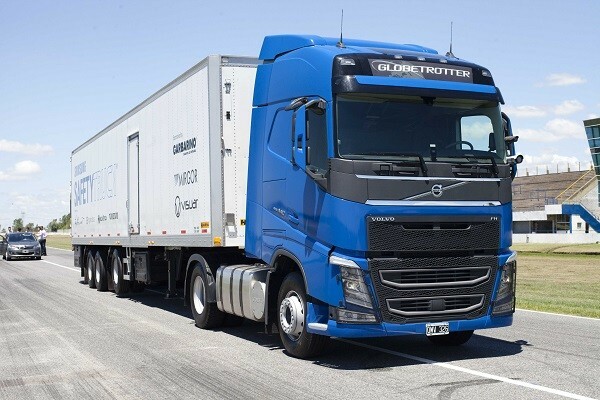 Under this premise, Volvo Trucks Argentina wanted to participate in the Samsung Safety Truck project to further promote reflections on a more secure future for both the truck driver and everyone else”. Interestingly, the Samsung Safety Truck was sponsored by Garbarino, an Argentinian retailer as well as electronics manufacturer Visuar and Mirgor, with factories in different parts of the country. Tons of domestic and international media as well as distinguished business leaders showing up for the Samsung Safety Truck product launch. This new product, conceived and developed entirely in Argentina, has already won awards such as the Titanium Lion at the Cannes Lions 2015, world’s most prestigious advertising festival along with three (3) gold and three (3) silver at the same award ceremony. They’ve also won two (2) gold Clios in digital and out of home categories, as well as three (3) silver Clios in the Direct, Engagement/Experience and Innovation categories. Time magazine has even labelled the Samsung Safety Truck as one of the ‘25 best inventions of 2015’. So what’s so special about Truck safety technology? 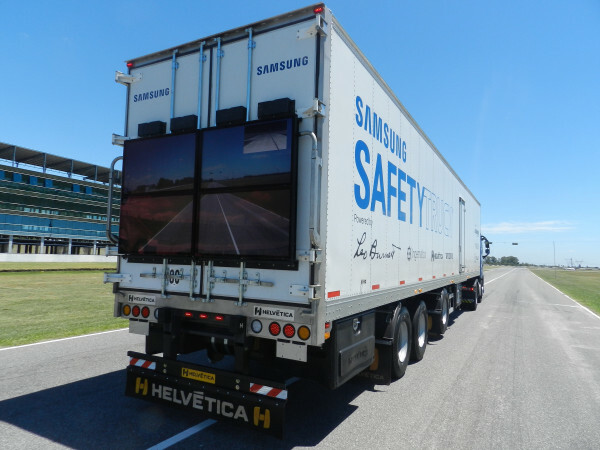 The Samsung Safety Truck is basically two built-in front cameras coupled with a specially-designed Ingematica transportation software platform connected to four (4) Samsung OH46D video walls. The fact that their imaging software is at the heart of this product is certainly something worth noting as pointed out by President of Ingema´tica, Alejandro Muther, quote: “Since the beginning of this project, Ingema´tica was involved in developing this innovative idea, seeking to give life to what at first seemed impossible and is now a reality. We are convinced that it will help save lives on the roads of our country and as an Argentine company, we are proud to have been able to develop a global solution locally”. It basically takes an image of the road ahead and projects it at the back of the truck, allowing the driver behind the truck to see around the truck before attempting to overtake the truck. Why no one has ever thought of this idea before is pretty mind-boggling to me, as the four (4) Samsung OH46D IP56 certified video walls which provide superior performance against even the most challenging environmental conditions makes this a very practical idea. Helve´tica, who were involved from the start, contributed both the trailer truck used in testing as well as their engineering staff to make this product a reality, to quote President of Helvetica SA, Raul Corna: “Helve´tica has over 110 years of history in the Argentine market. Throughout our history, we have always been pioneers in bringing innovation efficiency in the cargo transportation industry. Upon learning of this idea, we immediately contributed both the trailer and the know-how of our engineering team to achieve the adaptations the equipment required for the incorporation of this new technology”. So, the overtaking driver gets a super-high def picture of the road ahead, allowing them to evaluate more accurately passing potential and make more informed driving decisions, regardless of the road or weather. The Samsung Safety Truck is a simple idea that will definately save a lot of lives, to quote President of Leo Burnett Argentina and Regional Creative Director for Latin America, Fernando Bellotti: “In Leo Burnett Argentina we always try to think of ideas that are able to positively impact the lives of people. With the Samsung Safety Truck, we have taken a step further. Not only can it improve our lives, but it can also save them”. Hopefully Samsung makes this a permanent product, as it’ll translate to reduce insurance claims during accidents involving trucks and increased safety for the drivers travelling behind these big rigs!